Thanks to the driving forces of the Itô calculus and the Malliavin calculus, stochastic analysis has expanded into numerous fields including partial differential equations, physics, and mathematical finance. This book is a compact, graduate-level text that develops the two calculi in tandem, laying out a balanced toolbox for researchers and students in mathematics and mathematical finance. 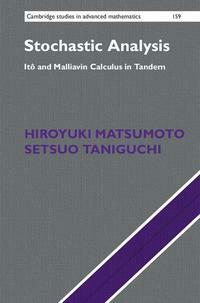 The book explores foundations and applications of the two calculi, including stochastic integrals and differential equations, and the distribution theory on Wiener space developed by the Japanese school of probability. Uniquely, the book then delves into the possibilities that arise by using the two flavors of calculus together. Taking a distinctive, path-space-oriented approach, this book crystallizes modern day stochastic analysis into a single volume.